"Italy Sorrento train - Sorrento is a perfect place to unwind, have lunch and do some siesta time gelato tasting or espresso sipping after your visit to either Capri or Pompeii..."
Getting from Naples to Sorrento by train is very easy and most importantly, very affordable. Besides taking a Sorrento ferry hydrofoil, taking an Italy Sorrento train is definitely one of the most popular ways to get there. If your Mediterranean cruise ship docks in Naples, this hectic and vibrant city will be a good springboard for your day trip to Sorrento. 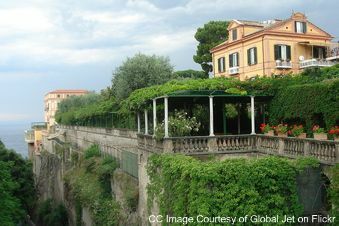 However, keep in mind Sorrento is quite a small town and Sorrento attractions are easy to see in two hours at the most. With many other attractive destinations in the Bay of Naples, we do suggest you combine it with the lost city of Pompeii or Capri Italy… your decision will depend upon whether you are more into ancient history or natural beauties combined with world-class shopping and star spotting. As a matter of fact, we would say Sorrento is a perfect place to unwind, enjoy some great Sorrento Italy weather have lunch and do some siesta time gelato tasting or espresso sipping after your visit to either Capri Italy or Pompeii. It’s the cheapest way to get there, excellent for taking a bigger family. 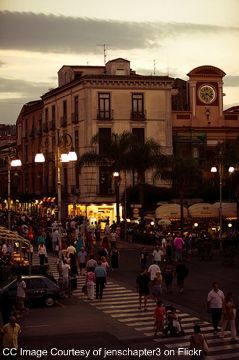 Once in Sorrento, you just need to walk for two blocks (5 minutes) to reach the main square of Sorrento, the Piazza Tasso. Departure times are quite frequent, about every 20-30 minutes. You need to organize your transportation from the Naples cruise terminal to the Naples Circumvesuviana train station. In this case, walking is not recommended as the part of the town you would be walking through isn’t the most pleasant. We do suggest you take a taxi, for approx. 10 Euros one way, or if you have time, wait for the local tram or bus #1 in front of the cruise terminal. Trains can be really hot, mostly not air-conditioned, seating is not very comfortable, and can get very crowded in the afternoon hours. You should be aware of your valuables on the train. Apart from that, it’s generally safe. It’s quite slow - the train ride takes from about 50 minutes to one hour and 15 minutes. You could be bothered by numerous gypsies begging for money. For the pros and cons of taking a Sorrento ferry hydrofoil click here. Now if you’re wondering how to get from Naples to Sorrento by train, it’s best you read our article on travelling from Naples to Pompeii as Pompeii is halfway through on the way to Sorrento, so the whole procedure is identical. That article will give you detailed instructions on how to reach the Piazza Garibaldi station, part of the Naples Centrale Station from which Circumvesuviana trains depart (and that’s the ones you’ll need). To find out your Naples to Sorrento departure times check the website that covers the Circumvesuviana trains' timetables in Campania. There find the timetable from Napoli to Sorrento in pdf. If you wonder how much the train ticket is from Naples to Sorrento, there you can find out the exact fee too. It is usually approx. 4.50 Euros per person one-way. If you came to Sorrento from Capri Italy or Naples using a Sorrento ferry hydrofoil and now wish to carry on to Pompeii Italy, or head back to Naples by Italy Sorrento train, first you will need to reach the top of the cliff from the Marina Piccola where the hydrofoils dock. To do that read the instructions in our article Sorrento Italy travel. If you’re really in a rush and don’t have time to stop by in Sorrento for a pizza or Sorrento wooden music-box shopping, we suggest you take a taxi from Marina Piccola straight to the train station. If you have more time on your hands but still wish to go straight from the hydrofoil dock to the Italy Sorrento train station, you can wait for the local bus Line B, it will depart from the little square by the Marina Piccola. If you need to reach the train station from the center of Sorrento, once you find yourselves on the main square of Sorrento (Piazza Tasso), you will head north-east down the Corso Italia and turn second right to reach the Circumvesuviana train station. It’s a 5 minute walk. You can buy your tickets at the booth and you will need to validate them inside the machine that controls the entrance gates. Check which platform (binario) your train to Napoli leaves from. Don’t worry, the train station in Sorrento is so small it will be very easy to find the Italy Sorrento train to Naples that you need. Hotels in Gulf of Naples - Planning to stay in or around Naples? HotelsCombined.com allows you to instantly search and compare room availability and prices from all major travel websites! Viator Bay of Naples and Amalfi Coast Tours and Shore Excursions - Compare prices to the ship offered shore excursions and book your own tours online!